1 When is it high impact to work at a non-profit? 1.1 But won’t I be replaceable? 2 How good is the career capital? 4 What are the main drawbacks of working at non-profits? 5 What roles are there? 7 If you already work at a non-profit, how can you have more impact? 8 Who is best suited to this path? 8.2 What is it like day to day? 8.3 How can you test your potential to succeed in this option? 11 Want to work at an effective non-profit? We want to help. Surgeon Christos Christou meets with a patient at Doctor’s Without Border’s clinic in South Sudan. Image credit: MSF. Working at non-profits is widely seen as one of the best options for making a difference with your career. According to a list put out by salary website PayScale, non-profit executive director is the fifth-best job for people who want to make a positive change in the world, and 95% of non-profit leaders say they are confident their work makes the world a better place. But we think this path is often overrated. Most non-profits don’t focus on the most urgent global problems, and even if they do, a significant fraction of social programmes don’t work, and most have never been tested. Many non-profits are also more short of funding than people, so working there doesn’t even do much to help the organisation. Indeed, 80,000 Hours is well-known for the argument that it can be more effective to earn to give than to work at a non-profit. What’s more, if you’re early in your career, working at non-profits can cut down your options and career capital. Non-profits are mostly small and have a shoestring budget, which means there’s often little room for training or career development compared to organisations in the for-profit sector. This makes it harder to move from non-profits into other sectors, than if you start your career elsewhere. This sounds pretty damning, but despite this, we think non-profit careers are worth considering Although many jobs in non-profits don’t have much impact, if you pick the right organisation, we think it can be one of the highest-impact things you can do with your life, and great for career capital too. Working at effective non-profits lets you have a big impact, whilst doing rewarding, meaningful work. But it’s crucial that you pick the right non-profits — look for organisations working on urgent global problems, that are well-run and are short of staff. You should especially consider this option if you’ve already built up skills by working in the private sector or through graduate study. Deep interest in problem area the non-profit works in, ability to quickly pick up new skills and knowledge, self-motivated, willing to earn less than one could in other areas. Find well-run non-profits working on urgent global problems (follow our advice on how to do this below). Test your fit by doing side-projects at non-profits through volunteering, freelance work or internships. If necessary, build relevant skills in the for-profit sector first (e.g. in consulting, finance, marketing, or tech), or through relevant graduate studies (e.g. economics, statistics). Follow our advice on how to get a job. Want to work at an effective non-profit? We want to help. For this career review we interviewed five leaders at GiveWell recommended non-profits, drew on our experience running a non-profit ourselves, as well as many informal discussions with other non-profit leaders. We also read the WetFeet Insider Guide to Careers in Non-profit, the Vault guide to the non-profit sector, and collected salary data from the Bureau of Labor Statistics. When is it high impact to work at a non-profit? We think the following criteria are key to separating high-impact jobs from the rest. If you stick to organisations like this, you can avoid the pitfalls listed in the introduction. The non-profit works on an urgent global problem, by which we mean a problem that’s large in scale, neglected and solvable. As we’ve argued, some problem areas are hundreds of times more effective to work on than others, so picking a non-profit working in a high priority area is hugely important. A programme with strong evidence of cost-effectiveness (e.g. distributing anti-malarial bednets). A test of a new programme, which has the potential to be highly cost-effective (e.g. text message reminders for vaccinations). If it’s not feasible to test a programme empirically, then strong theoretical reasons to expect a high upside (e.g. developing a Global Health Security Index to ensure governments invest enough in biosecurity, advocating for greater debt relief for developing countries, research into how to make advanced AI systems safe). Many non-profits work on programmes which have no evidence of effectiveness, which we estimate reduces their expected impact 2-10 fold. It has a scalable model. Imagine two non-profits implement programmes with the same cost-effectiveness, but one of them has a credible plan to scale its programme ten-fold in the next five years, while the other expects to be the same size in five years. Clearly, it’s better to work at the non-profit with a scalable model — your work will contribute to a bigger impact in the long-run. A major bottleneck for the organisation is hiring extra staff. Some non-profits are far more short of funding than motivated workers. If you work at an organisation like this, not only will you have little impact, it’ll be hard to earn a living too. Instead, it would be better to support the organisation by earning to give. However some non-profits are well-funded, but are bottlenecked by being able to hire extra staff. If you work at these non-profits, you’ll have more impact. You have great personal fit for a position at the non-profit. Even if the organisation is constrained by being able to hire extra staff, it might not need your particular skills. The key is to find an organisation which has a need for what you can offer, in a role where you have the chance to excel (“personal fit”). As we’ve suggested, if you find a role where you have great personal fit, you could easily achieve ten times as much. To sum up, if a well-run non-profit implements a promising programme in an urgent problem area, it’s likely to be a high-impact organisation. If it’s also bottlenecked by talent and you have good personal fit for a particular role, then you working there is likely to be very high impact. A non-profit doesn’t have to meet all of these criteria, but it should do well on the balance of factors. For more non-profits, see our problem profiles. Some people worry that since lots of talented people want to work at non-profits, if you don’t take a job, someone else who’s capable will do it, so you won’t have much impact. If you have unusually good personal fit for a role, you’ll have far more output than the person who would replace you. If it’s a specialised role that would take a long time to hire for, but you already have the right skills and can start right away, then your position would have remained unfilled for a long time. If a non-profit has a major funder who is willing to provide funds to hire anyone who meets a certain standard (“threshold hiring”), then by taking the job you’re increasing the number of employees at the non-profit. Even if someone equally competent would have filled the position if you didn’t take it, by taking the job you free up that person to work somewhere else that’s high-impact. For example, if you take a job at a non-profit that campaigns against factory farming, the person who would have replaced you will now probably go and take a job doing something else that helps animals. We call this the “spillover” benefit of taking the job. We cover these points in more depth in our review of working at effective altruist organisations, and in an upcoming article. But the bottom line is that if you’re a good fit for a non-profit that’s bottlenecked by hiring, you’re not easily replaceable. However, sometimes you might be able to have even more impact if you earn to give and donate to the non-profit, instead of working there yourself. We address the question of when it’s higher impact to earn to give in a later section – the answer depends on your specific situation. For the most part, we discourage people from working at non-profits at the start of their career, because top private sector jobs, like consulting, tend to offer more flexible career capital — the skills, connections and credentials that put you in a better position to make a difference in the future. This is because top private sector jobs let you build connections with talented colleagues who go into a wide range of sectors, give you widely recognised credentials, and often give you better training than non-profits. It’s also more common to go from the corporate sector into non-profits than the other way around, so if you’re considering both, it can be better to work in the corporate sector first. When we asked leaders of international development non-profits whether they’d advise graduates to work at non-profits straight out of university, the majority recommended first building skills at highly selective private sector organisations. If a non-profit works in an important problem area, the connections you build will be especially valuable for your future impact. A strong network in, say, nuclear security, helps you get related jobs in the future, puts you in a position to influence other people working in the area, and helps you spot opportunities for new types of organisations, collaborations and projects. This is much more useful for your future impact than just knowing people who work in finance, management consulting or accounting. Being surrounded by people who care about social impact also helps maintain (or even raise) your levels of altruistic motivation. If a non-profit is well-run and has great managers, then you’ll get good training and mentorship. If a non-profit is growing, you’ll often get more responsibility as it grows. This lets you learn more, and you can get impressive achievements due to having higher levels of responsibility. Some non-profits are already well known and seen as impressive places to work at, for example Khan Academy, or GiveDirectly. As always, if you have great personal fit for a role, you’ll get more impressive achievements and build more valuable connections. So if you find the right job, at the right non-profit, you can build as much career capital as you would in many top corporate positions. Doing work that you’re good at, and which helps others, are probably the two most important determinants of job satisfaction. If you’ve chosen an organisation that you believe is high-impact and where you have good personal fit for the role, you’ll probably be pretty satisfied. If you’re working with a good team, and mentored by a good boss, you’ll also likely have autonomy, frequent feedback, and good social support at work. What are the main drawbacks of working at non-profits? If you want to earn as much money as you can, the non-profit sector isn’t the place to do it. 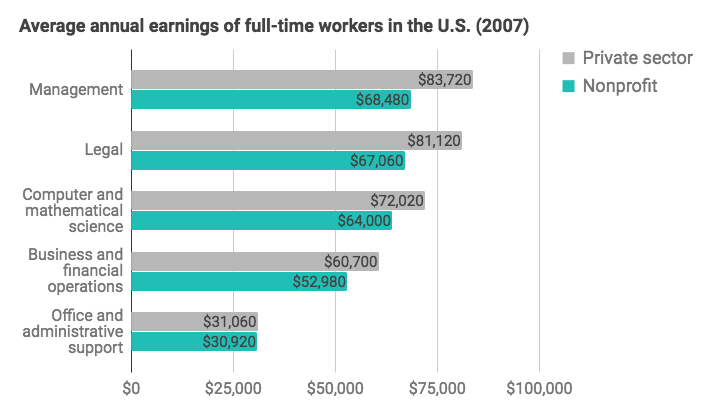 Many people end up with a salary that’s less than half of what they could earn in the highest paying jobs. The exception is office and administrative support roles, which earn roughly the same in both sectors. You can see the average salaries for 236 different non-profit positions in this report. We think that these salaries are roughly what you need to be happy, but compared with jobs in the private sector, it is harder to build up a savings buffer to withstand financial difficulties, and to make career transitions which require retraining. It can also be more difficult for people with children. If you thrive on clear deliverables, discernable targets and organisational clarity, then working at smaller non-profits may not be for you. Smaller non-profits try to fulfill their missions with limited staffing and resources, which means they often have less clearly defined job roles and a loose management structure, which can be stressful and demotivating for some. However this is less of an issue at more established and better funded non-profits. Programme delivery – implementing a non-profit’s programmes, for example making unconditional cash transfers, or delivering anti-malarial bednets. Activities include managing and coordinating teams, developing new partnerships with implementing organisations, with donors and subject-matter experts, ensuring quality of delivery, and expanding programmes into new geographic regions. Programme managers (sometimes called programme directors) lead on programme delivery. They are often supported by project managers, programme assistants and volunteer coordinators. For more concrete details of what these roles involve, see for example this job description of Program Director at No Lean Season. Monitoring and evaluation – measuring programme costs and outcomes, and producing reports for staff and donors. Depending on the programme, this can require specialists such as epidemiologists or health economists. Fundraising – activities include writing grant applications to governments and foundations, finding new donor leads, running fundraising events, and developing the overall funding model for the non-profit. A common job title is “Director of Development”. In smaller non-profits this role may be done by the CEO. Communications and marketing – activities include writing content for social media, managing online ad campaigns, writing newsletters, optimising website conversion rates, speaking to the press, giving talks at events. Web development and web design – for example building and maintaining websites; creating images and graphics such as logos, icons, illustrations and charts. Administrators and assistants – wide ranging activities including managing schedules of senior staff, accepting visitors, organising office social events, purchasing office food supplies. 1. Pick 2-3 global problems that you think are most urgent. If you’re not sure where to focus, see our article about how to compare problems, and our current ranking. Are well run, with a great team. It’s hard to find an organisation that has it all. Rather, look for organisations that do well on the balance of the factors. Have a good explanation of why they need more staff, and why hiring for their positions is difficult. Find it easy to fundraise. Have positions that haven’t filled for a long time. We explain how to assess your personal fit for specific roles below. If you already work at a non-profit, how can you have more impact? If you’re already working at an effective non-profit, then just focus on performing as well as possible. Read our advice on how to perform better at your job. But if you don’t work at an effective non-profit, what are your options? Switch which programme the non-profit works on. See GiveWell’s list of priority programmes to get ideas within international health and development, and Animal Charity Evaluators’ list of interventions within animal welfare. Develop better plans for scaling programmes with strong evidence of effectiveness. You can get ideas for funding models which could let your non-profit grow in this Stanford Social Innovation Review article. However, scaling programmes without evidence of effectiveness is a waste of resources, and can easily be harmful, so make sure there’s enough evidence of impact before advocating for growth. Make the organisation generally better run. See the best resources we’ve found on management. If the non-profit is working on a moderately pressing area, and you’re an unusually good fit for the organisation, then improving the non-profit from the inside could be your top option. One thing to bear in mind is that some opportunities to improve the organisation are probably dramatically more effective than others, so choose your battles carefully. On how to best advocate for change, two of the best books we’ve read are Switch by Chip and Dan Heath, and Originals by Adam Grant. Both are written by psychology professors who aim to sum up the relevant research in practical terms. However, given that some problem areas are hundreds of times more effective to work on than others, the choice of area will often outweigh the other factors, so in the long-run it may be higher-impact to switch organisation (provided your personal fit is not dramatically worse). Who is best suited to this path? The specific qualifications and experience required to work at a non-profit vary a lot depending on the organisation and role, so you have to check for each job. You can see the requirements for some non-profit jobs on our job board. One thing to bear in mind when looking at job adverts is that stated “requirements” are often just wishlists – you often don’t need to meet all of them in order to land the job. One generalisation is that non-profits usually look for (i) knowledge of the problem area gained through volunteering or work experience, and (ii) relevant skills for the role, gained through work experience or graduate study. “We’re still in start-up mode and are flying the plane while building it. It’s been invigorating and exciting, but it will be nice when we are more fully staffed and are able to settle into our roles more.” — Employee at the Good Food Institute4. ”It’s not uncommon for me to substitute for the receptionist, help out with data entry, or even work as a busboy at organization fundraisers. If there’s something you don’t know, you’ll be expected to learn it and fast.” — Non-profit case worker5. Less employee oversight and guidance than in large private sector companies or in government. For example, there often aren’t existing processes and guidelines for the tasks that you’re doing, so you have to develop your own processes. The pace of work tends to be slower than in the private sector, but faster than in government. Hours tend to be shorter than in the private sector, but longer than in government. How can you test your potential to succeed in this option? Read what’s available online about the organisations and the roles you’re interested in. Try to find out what roles the organisations are hiring for, what the work involves and what programmes the organisations run. Talk to people working at the organisations: ask them what kind of people tend to do really well and try to build up a vivid picture of the day-to-day reality of working there. We’ve put together a list of email scripts you can use when asking for introductions and small favours from people you don’t know. Do a short project for the organisation as a volunteer, freelancer, or as an intern. If that’s not possible, try doing a project with another organisation in the same problem area. This will both test your personal fit, help you build connections, and let you demonstrate your fit to the organisation. When is it higher-impact to earn to give? We recommend that you ask the non-profits you’re considering working at whether they’d prefer you to (i) earn to give and donate to them, or (ii) work for them directly. If they’d prefer you to earn to give, then you should probably do that, and donate to wherever you think is highest impact (which may be a different organisation). If you would donate somewhere that’s several times more cost-effective, then earning to give could still be higher impact than working for the non-profit. If you’re very uncertain about which problem areas are best to work on, and you expect to change your views in the future, then earning to give could be higher impact because of the greater flexibility it gives you (it’s easier to switch donations than to switch jobs). If you’d get better career capital in the earning to give option, your long run impact could be higher if you earn to give instead of working for the non-profit. When is it better to build career capital in the private sector? As we’ve suggested above, if a non-profit is well run, is growing, and has a great team and management, then it could be competitive with the private sector for building skills. If it also works on a high priority problem area, you’ll likely build more valuable connections than you would in the private sector. However, the decision often turns on the specifics of the roles you’re considering, and we recommend that you run through our checklist for comparing the career capital of specific jobs you’re choosing between. When making the comparison, don’t forget to factor in your degree of personal fit for each option, since it determines how much you’ll be able to take advantage of opportunities to build career capital in a role. For example, if you’re a poor fit for consulting, it’ll be hard to get impressive achievements, gain responsibility, and to build valuable connections. You could be better off working at a non-profit that you’re a good fit for, even if it offers less formal training. How certain are you about which problem areas are best to work on, and how much do you expect your views to change in the future? The more you’re certain, the more that favors working at a non-profit and building expertise in a specific problem area. If you’re very unsure, the more that favours the private sector, because it keeps your options more open, and it’s easier to save money for making career transitions. How much career capital do you already have? The more skills and connections you’ve already built, the less weight you should give to career capital, and the more you should favour working at non-profits. When is it better to do graduate study? If you’ve just finished your undergraduate degree, then you should probably wait a year or two before starting graduate study, and try out working at non-profits. How useful is graduate study for the role and problem area you want to work in? In some areas, for example biosecurity, graduate studies in public health or synthetic biology are useful. But in other areas and roles graduate studies don’t help you very much. How uncertain are you about which problem areas are best to work on, and how much do you expect your views to change in the future? The more you’re uncertain, the more that favours doing graduate study in a subject that prepares you for a wide range of roles, such as economics, maths or statistics. The more you’re certain about which problem area to work on, and if graduate study isn’t particularly helpful for working in the area, the more that favors working at a non-profit. Your relative degree of personal fit. For example, if you could work at one of the best non-profits working in a particular area, but could only get into a mid-ranked PhD program, that favours working at the non-profit. However note that many positions aren’t openly advertised and positions get created for people who are a good fit for organisations. Also bear in mind that our list is far from exhaustive. You can get more ideas for places to work in our wiki. Once you’ve got some options, remember to get referrals for the jobs you’re applying to and follow the rest of our advice on how to get a job. Find out what current employees did prior to getting a job at the non-profit. If you have an unusual background, then look for people with unusual backgrounds who work there (or at related non-profits) and find out what they did differently. We’ve put together a list of email scripts you can use when doing this research. Do a relevant side-project with a related organisation as a volunteer, freelancer or intern, for example organising an event or a fundraiser, or doing a research project. Work at a related organisation. Just make sure you check whether transitions from the organisation into your target organisation are actually common. Sometimes working at a “second tier” organisation can make it harder to get into the top tier.